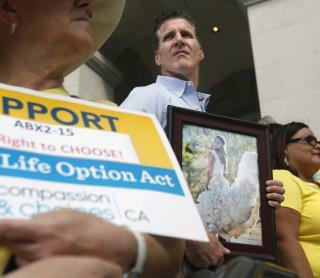 (Newser) – A California judge on Tuesday threw out a 2016 state law allowing the terminally ill to end their lives, ruling it was unconstitutionally approved by the Legislature. Riverside County Superior Court Judge Daniel Ottolia said lawmakers acted illegally in passing the law during a special session devoted to other topics, according to lawyers for supporters and opponents. He did not address the legal issue of whether it was proper to allow people to take their own lives, and gave the state attorney general five days to appeal, the AP reports. Alexandra Snyder, an attorney and executive director of Life Legal Defense Foundation, said the judge ruled that lawmakers effectively "hijacked" a special legislative session that was called to address access to medical care and used it to pass their bill. I'm so glad my step-mother had the medical assistance to take her life April 7th 2018 just before this Judge stopped her ability to do so. She was is excruciating pain. She was in hospice care. We dosed her every 3 hours with morphine, AND methadone every 12 hours. Even with these strong pain meds she weeped and begged for relief. When she slept she would toss and turn screaming that it "hurts". My sister and I took turns sleeping in the livingroom where her hospital bed was stationed. Until you have sat at a loved ones bedside who is writhering in unrelenting pain, don't pass judgment on those that decide to end the pain....She even had a living memorial with all of her lifelong friends in attendance...to say goodbye. Her loving daughter...I miss you. Should always be a personal choice, without the government sticking their noses in it. I think I have a way better suicide plan for people wanting a neat end. Rig up an ultra-light aircraft with an extended fuel tank. Set out about an hour before sunset and then just fly westward from a place like Malibu. Enjoy your slow flight at around 7000 feet and keep going until dark and then you run out of fuel and glide into the ocean.